Happy Valentine's Day to us! Jon and I decided to do a joint gift this year and treat ourselves to another set of our most favorite sheets EVER. Sense of Touch-Air sheets are the most comfortable sheets I've ever laid on in my life. They weren't kidding when they called them Air. They are so light and soft! Seriously. You should get some. We first found these when we were registered for our wedding and were lucky enough to receive a set from Jon's aunt and uncle. They had given us a white set, so this time we ordered the silver ones, which are really a beautiful gray color (as shown in the picture below). The color contrasts wonderfully with our white duvet cover too. Needless to say, we wasted no time in getting these bad boys on our bed. This better shows the color. If you're wondering where you can get some of these gems for yourself, we got our's from Bed Bath and Beyond. I'm not sure if they sell them anywhere else or not. They aren't in all of their stores though, so I would call ahead to check first or you can order them online if you're not close to one like us :) Either way, I promise you'll love them! In other Valentine's Day weekend news, I tried to bake some chocolate marshmallow creme filled cupcakes (Martha Stewart recipe) for our dessert on Saturday night, and it was a major fail. They didn't taste bad but the presentation was horrible! Due to a slight oversight on my part (needing a jumbo cupcake pan instead of a regular one), all of the cupcakes melted together and were ridiculously hard to get out of there cups--which meant a lot of crumbling cupcakes. I made everything from scratch and worked so hard to make them right, and this is the best one I had to show for it. Pretty sad, huh? I think only 6 of the 12 survived after being excavated from the pan. 2. In a large saucepan, melt butter over low heat. Stir in the package of dressing mix. Blend in wine and golden mushroom soup. Mix in cream cheese, and stir until smooth. Heat through, but do not boil. Arrange chicken breasts in a single layer in a 9x13 inch baking dish. Pour sauce over. 3. Bake for 60 minutes in the preheated oven. Twenty minutes before the chicken is done, bring a large pot of lightly salted water to a rolling boil. Cook pasta until al dente, about 5 minutes. Drain. 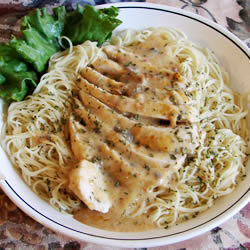 Serve chicken and sauce over pasta. Although the sheets were supposed to be our only gift, I couldn't help but get a little something for him. And since I know he won't be reading this today because he's flying, I'll fill you in. The first is actually a gift that I will use, but he will appreciate the most. I got him a book light. A book light?! I'm sure you're saying, but let me explain. I like to lie in bed and read before I go to sleep, and since our bedroom is on the slender side, we only have one side table/lamp by our bed, which just happens be on Jon's side. He often has to be up early to fly and needs to go to sleep early, yet he is always so sweet and keeps the light so I can see. Now he won't have to! For the wrapping, I used postal paper and some red ribbon and cut out a heart in the same wrapping. I love how vintage it looks.